Sportlobster is a social networking site for sport lovers. Whether it’s football or Moto GP, the iOS app is free to download and aims to be the only place you need to go to find out about your favourite sports. F1 driver Mark Webber and former footballer turned commentator Michael Owen have already invested in the app that’s also available to access through the Sportlobster website. This is not the first time a social networking service dedicated to sports fans has attempted to filter out the people constantly talking about X-Factor or Instagramming photos of Sunday roasts. Fanatix (cricket) and Bantr (football) offer similar services but only focus on one sport. 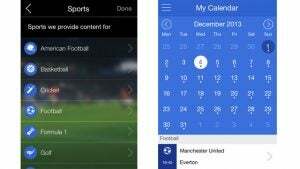 Sportlobster promises to do a whole lot more and has definitely made a decent start. Convincing users to migrate from Twitter and Facebook is always going to be one of the biggest challenges any new social networking site has to overcome, so it’s no surprise the setup process let’s you log-in via both sites. You can alternatively log in by email if you are not already signed up to either of the two. Next up, there’s setting up a user profile and picking the sports to follow. There’s over 30 sports to select ranging from golf to triathlons and you can pick as many as you want. Additionally, you can choose specific teams whether it’s international sides or domestic clubs. The UI is essentially broken into two and the first part is the Facebook-style main feed. The similarities with the friend-collecting site are clear to see using the same white and blue colour theme and image-dominated layout. You can even like, comment, share or report inappropriate updates and swipe down from the top of the feed to refresh with the latest content. It does at least try to make the experience slightly different adding the ability to filter the main feed by people you follow and everyone who uses the service. The other part of the UI is the drop-down menu over on the left hand side where you’ll find shortcuts to all of the main features and preferences for the teams and sports you’ve chosen to follow. In preferences you can still add additional sports later on and if you click on the sports you have already selected, the app searches for related fans, posts, blogs, events and news. One of the best features is My Calendar. Based on preferences it will pick out key matches and events and plot them into the calendar. So if you pick cricket, it will fill the built-in calendar with key matches. Integration with native calendars would be a nice touch, but it’s a great way to have your sporting calendar planned out for you weeks and months in advance. Additional features include notifications to see when people have liked your post or started following you. The news tab includes news content written by the Sportslobster team and can be filtered by preferences or what’s popular. There’s a results predictor games as well and a place to check fixtures and results. Blogging could be Sportslobster’s killer feature. For those who don’t like to be restricted to 140 characters, there’s a dedicated section to read other blogs and even write your own. The better quality posts you write, the more blogging points you accumulate. Established sports journalists such as Sid Lowe and Jonathan Wilson have already contributed pieces, but it’s obscure sports that usually don’t get picked up by mainstream sites that could benefit most from the greater exposure. Like any new social networking site, the size of the community will dictate its success. Sportlobster still has some growing to do and while popular sports like football and cricket are well catered for, a quick search for anything related to Triathlons and the content is non-existent. There’s still a few minor bugs to sort out as well. The app did crash on us a few times but it’s the search filter that needs a little work. Currently, if you search for sailing, the generated results will pick out any user that has used the word sailing even if it has nothing to do with the sport. At the moment, there is plenty to really like about Sportlobster. Despite the clearly Facebook and Twitter-influenced features, the slick UI and unique features like built-in blogging and sport calendar really stand out. If the big names keep backing it and the content for lower profile sports continues to grow, this could be one app to watch out for in 2014. The post Sportlobster appeared first on Trusted Reviews.